I have quite a lot of candles and wax melts, but I feel like there's a big gaping hole for a reed diffuser or two. I think the Next ones look simple but classic and the scent lasts for at least 3 months depending on which size you buy. Amalfi is described as a "fresh, airy and clean" scent that captures the scent of the beach, which sounds perfect for both Spring and Summer. As the temperature starts to (slowly) rise I tend to swap powder products for creamy ones, especially blusher and eyeshadow. I've been using a powder eyeshadow over winter to fill my brows (Urban Decay Naked2 from the Basics palette), but now want something longer lasting and a bit more natural looking. The NYX Tame and Frame Brow Pomade is meant to be a good budget dupe for the Anastasia one, so I'm keen to give it a try. This nail polish has popped up on quite a few blogs in my feed recently and it was love at first sight. I'm not the biggest fan of bright, fuchsia pink shades, so I always gravitate to more muted tones and this dusky tea rose shade is just gorgeous. Soon it'll be time to ditch my thick, heavy knitwear for more lightweight items and this River Island jumper fits the bill. I love simple styles but with an added twist, which I think is what this cross back provides. It is described as a relaxed fit and would look great for a casual Sunday with jeans and Converse. I've actually had this on my wishlist for awhile, but have been putting off buying it, mainly because it's so expensive for a lip balm. However I can see me getting so much use out of it now it's Spring with its pretty pink tint. 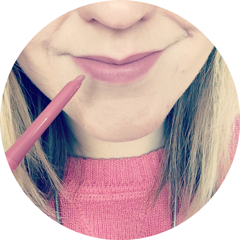 Plus if you look at the ingredients list is contains so many moisturising oils, plus it contains SPF, so protects your lips at the same time (can you see how I'm justifying it to myself as I write?!). It's definitely not warm enough in the UK to get my arms out yet, but hey, we do get those random hot days in Spring sometimes, plus that's what cardigans are for! My brother gave me a House of Fraser gift card for my birthday and I've already decided I'll be spending it on this Oasis t-shirt. I love a classic white tee, but with blue embroidered anchors on it too? I'm sold. I'm not sure if this is permanently reduced or just currently on a special limited time offer, but I won't be missing out that's for sure. My current Accessorise bag has been used to death; so much so that the outer material has completely worn away on the handles and it needs binning. I don't think you can go wrong with a tan bag like this Oasis one because it goes with everything and works well for all seasons, plus it looks like a good size. I only have one vase and it's quite wide and tall, which doesn't accommodate smaller bunches of flowers very well. I have been regularly buying Spring flowers such as daffodils, tulips and chrysantheums to brighten up my living room and I need a small glass vase like this desperately. I've seen it in store and for the price, it actually seems quite good quality. What's currently on your Spring wishlist? I really want to try the Fresh lip scrub, it's supposed to be one of the best! I love that Oasis bag, the colour has drawn me in! Woah, FINALLY. I've wanted to buy a new Fresh lip balm for literally years, I always mean to go to the store in London but never make it. Totally ordering one! Thanks! Lovely post. That NYX brow pomade looks good.